Allergy season is upon us! Check out the useful information from guest blogger, John Good. Also, be sure to proactively eliminate allergens with a high quality air purifier. Our favorite is IQAir, available on our BHI site. All of us at some point in our lives have suffered from allergic symptoms. We are all familiar with the reaction, being it a respiratory reaction or related to skin. For some of us, they can occur as often as every day and regular doses of medicines or allergy shots have to be taken to avoid the irritation due to the nasty allergic encounters. Different people can be allergic to different things; they can range from food to insect bites. Everyday all of us are exposed to various potential allergens, who we encounter throughout the day. Anything a part of your environment can trigger the allergic reactions, but the one in discussion now is airborne particles which are one of the most common causes of allergies in man. To know more, we must first ask ourselves the very basic question, what is an allergy? An allergy is an overreaction of the immune system to a substance that is harmless to most people. The immune system is the body’s defense system. It helps defeat any pathogenic or unwanted particles who have gained access to our body by producing antibodies (pathogen destroying chemicals). To people who are allergic, their immune system acts in appropriately when an allergen gets inside, this is because the immune system thinks that the body is under attack when it is really not. At this instant, the immunity system secretes various chemicals in the blood stream which can cause painful and irritating sensations which we call allergic reactions or symptoms. 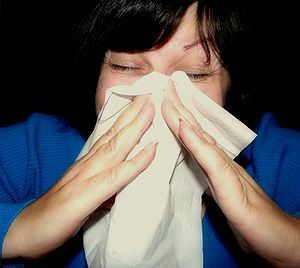 The immune system of the body adapts itself to the pathogens and every time they enter the body, the immune system comes into play and the same way, the immune system adapts itself to the allergens. And every time they enter your body, you feel the allergic reactions. Allergies are annoying, irritating, and a pain. They make us miserable and disturb our day to day activities. Care must be taken by people with allergies to identify and avoid the allergens. People suffering from allergies from airborne particles, should be very cautious. The living place must be free from dust and clean and should avoid going to areas of their allergens. If the reactions are frequent, then shots must be taken. If you think you might have developed an allergy or multiple allergies, then a visit to the doctor is mandatory. Air is everywhere and we need it. So, we cannot avoid airborne particles. So if you are allergic from airborne particles, you should be extra careful and seek aid from a specialist so that your day to day your day to day activities are undisturbed. Juicer Reviews Hub has the best juicer reviews.Visit us to find out more about the different juicers.